Produced in England, this remarkable, tense drama is based on the Barcelona Disputation that took place in the court of King James of Aragon in 1263. It is a fascinating and empowering film for all to enjoy. Starring: Christopher Lee, Toyah Wilcox, Bob Peck, Alan Dobie, Bernard Hepton. 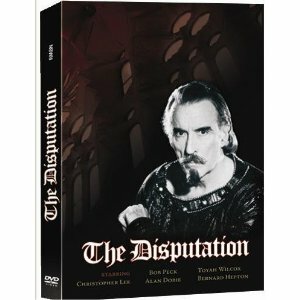 Produced in England, this remarkable, tense drama is based on the Barcelona Disputation that took place in the court of King James of Aragon in 1263. During the Middle Ages, there were numerous disputations between Jews and Christians, but the Barcelona Disputation was unique. The other notorious debates were not authentic, but attempts by Christians to force conversion on the Jew. The Barcelona Disputation, on the other hand, was the only occasion on which the Jewish spokesman was allowed to speak freely. This led to a genuine, eye-opening confrontation between Judaism and Christianity in which the basic differences between the two religions were brought to light. The Jewish side was represented by Rabbi Moses ben Nachman (Nachmanides), the leading Talmudic scholar of his time. The apostate Pablo Christiani aggressively led the Christian side. Finely acted by an extraordinary distinguished cast, the story examines the disputation between the Christians and the Jews where Nachmanides used his unparalleled knowledge of sacred literature and the power of his oration to defend his faith. In the end, King James of Aragon rewarded the “Rabbi of Gerona” 300 dinarim for his courage and success in the disputation. It is a fascinating and empowering film for all to enjoy. Starring: Christopher Lee, Toyah Wilcox, Bob Peck, Alan Dobie, Bernard Hepton.